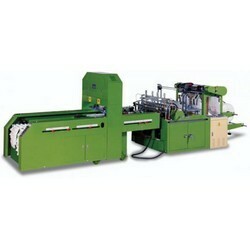 •Machine is automatically stopped if a bag is jam or miss the printing mark. •A puncher and conveyor unit in-line are for full automatic printed T-shirt bag production to save labor costs. Servo motor is an option. We didn't show all specification & model, please kindly contact us for other model & details specification. Bag width 18" 26" 30" 14" + 14" 16" + 16"